McNeel Miami and Universidad Nacional de Colombia, Medellín are conducting a four-day intensive Rhino Design-Optimization-Fabrication workshop. 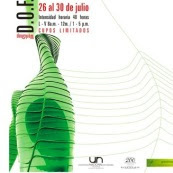 Design-Optimization-Fabrication (DOF) is the exploration of form and space using algorithms and parametric models. Participants will explore and optimize design and manufacture complex topologies using Grasshopper, RhinoNest, and RhinoCAM. Brazil for Rhino will be used for high-end rendering.